Member Affiliations: FEI, USEF, AVA, USDF, BEV. Carolyn earned a Gold Medal at the 2010 Alltech World Equestrian Games with Palatine and the F.A.C.E Vaulters. Carolyn studied at the Fulmer School of Equitation, with dressage instructors Robert Hall and Liz Brown who really influenced her philosophy on riding. Her focus on biomechanics and positive reinforcement allows for great success both in and out of the show arena. Carolyn has consistently found success throughout the years. Her clientele in Dressage consists of mostly adult amateur riders competing 2nd level through PSG. Carolyn’s training philosophy starts with getting a horse and rider working in harmony starting on the lunge line with the rider attaining independent balance. Carolyn has an extensive background of starting and training young horses of all breeds. Her ability to utilize correct lunging, allowed for a serendipitous affiliation when Carolyn was introduced to vaulting in 1995. Carolyn’s expert skills in lunging the horse was immediately appreciated by the vaulters. Since the inception of vaulting into Carolyn’s life, she has been the sole horse trainer and lunger responsible for the success of the FACE Team and vaulters. Carolyn’s immediate assessment of a horse, and her problem solving initiatives, has helped FACE at home and internationally. 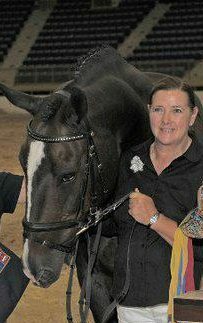 Carolyn has been an integral part of the Team being on board at World Championships as the horse expert. Currently training and lunging for Pacific Coast Vaulting Club, riding, training and clincing Worldwide. Carolyn was the first recipient of the American Vaulting Association’s ‘Trainer of the Year’ award, for her invaluable assistance in the success of the Vaulters at the 2006 Aachen World Equestrian Games. To date, Carolyn has trained numerous vaulting horses to continuing success. The success Carolyn believes is in fair and rewarding training, and the absolute emphasis on good basic training, straightness (even on a circle), and self-carriage. Simply stated ‘regardless of breed any horse can obtain a 7 for a horse score, when adhering to the ‘Training pyramid or scale’ our job as lungers and horse trainers is to facilitate the vaulters by putting under them well trained horses. In 2011 trained and lunged by Carolyn, Palatine (Westfalen gelding) received the USEF HOTY Champion for Individual and Pas De Deux. Sir Anthony Van Dyck (draft cross gelding) was reserve Champion for individuals.